When transferring the domain out of NameCheap I saw lot more issues and this made me to move all my domains out of Namecheap. 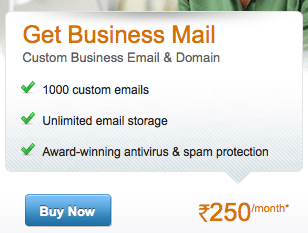 I am writing this article once all my domains are out of Namecheap. 12 April 2013 is when I wanted to transfer out my domain imbiz.in into GoDaddy because it is not an active site on that domain and so thought of moving it to GoDaddy because GoDaddy is really cheap for such domains. The domain was in namecheap.com because I got some offer for .in domains (if I remember correctly). I have been moving quite a few domains and so I know the complete process very well and normally we get a transfer approval email which can help you transfer your domain almost instantly. 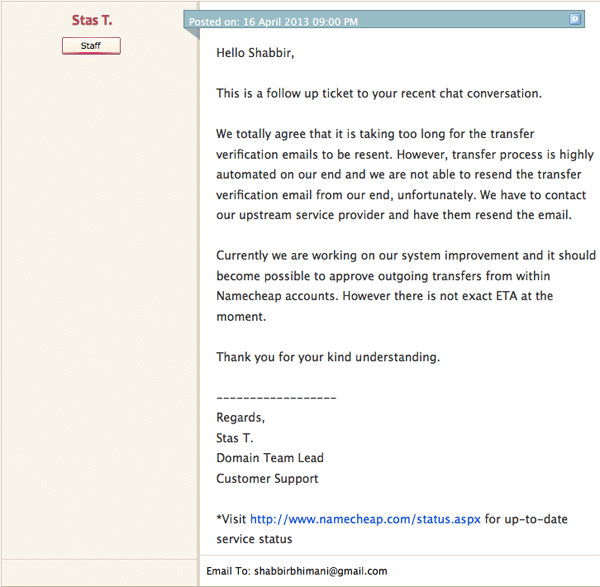 Your old registrar normally sends this email and Namecheap was not able to send this email. Once I contacted their support, their response was we have sent your query to our upstream provider and as soon as they will respond, we will update you. See the attached response from the ticket. You will not see my response to the ticket because I was asking in chat support daily once. Their support staff also acknowledges that their upstream provider takes very long to respond. Tried contacting support multiple times that I have not got domain transfer approval email and after almost 72 hours of constant follow up, found that they don’t send transfer approval mail for country specific TLD like .in. Similar issues exist in name.com as well. The email does not come for domain transfer approval but if you contact support, they send the email for you. Pretty OK I would say. Still shows in my Namecheap account. BTW I have transferred all the above domains out of NameCheap and those domains are still showing in my Namecheap account. 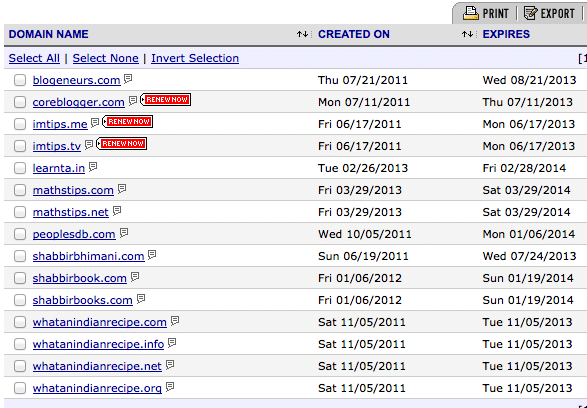 I transferred one .in domain from Name.com in the same order where I transferred all Namecheap domains. Name.com interface did not show my domains once it was transferred out. I am not sure who voted for NameCheap as the popular domain registrar in Life Hacker. I assume they asked their existing customer to vote for them. For such a horrible service, you have to have a real cheap pricing for the domain but their pricing is always higher than GoDaddy. Are you still having domains in Namecheap? Planning to move out? Share your views in comments below. Do you think it’s wise to transfer domain from Bluehost to GoDaddy? Yes because I don’t want my domains to be with my hosts. I used to use Godaddy, but I transferred to Namecheap a year and a half ago (I believe) when Godaddy came out in support of SOPA/PIPA. I didn’t want to be a part of their registrar at the time, and so I moved my domains to Namecheap (the few that were still being used) and started buying all future domains at NC as well. Now though, after some very rude support recently, I’m considering moving back (seeing as SOPA is dead). The only problem is I have quite a few domains on NC now and I really don’t want to pay to transfer them all. But as they are about to expire, you anyway may need to pay to renew them and so instead of renewing, you can transfer them to other hosts. You shouldn’t have choose NameCheap in first place. I also have a bitter experience with them. GoDaddy by far served me really well, what they lack is support. I chose namecheap because I wanted to move out of GoDaddy and saw that it is one of the most love ones by LifeHacker. Now I am moving to gandi but it is really costly.